For both solid surfaces and water there is a critical angle of impact (incidence) below which a bullet striking the surface will ricochet rather than penetrate. * The critical angle is determined by the nature of the surface, the construction of the bullet and the velocity of the bullet.12 Thus, round nose bullets are more likely to ricochet than flat-nosed; fullmetal-jacketedthanleadandlow velocity more than high velocity. If theangleof incidenceis greaterthanthe critical angle, the bullet either penetrates the surface or breaks up. In the latter case, if fragmentation is extensive, the fragments may come off the surface in a fan-shaped spray parallelingtheplaneof the ricochetsurface. 10 to 60 degrees.15 For both calibers, at angles of incidence of 30 degrees or more, the bullets fragmented. At angles below 30 degrees, they tended to remain in one piece though they flattened out. The ricochet angles off the steel plate (incident angles 10 to 60 degrees) were less than 5 degrees for the 9-mm bullets; less than 4 degrees for the .45 ACP bullets. These figures were also true for the concrete slab with but one exception. A .45 ACP bullet, with an incident angle of 50 degrees, fragmented with a fragment of copper jacketing coming off the slab at a ricochet angle of 12.37 degrees. * The angle of incidence is the angle formed by the trajectory of the bullet prior to ricochet and the surface from which the ricochet occurs. Modified from Haag, Reference 13. Houlden also determined the remaining energy of the ricocheting bullets and fragments.15 The determining factors were the angle of impact and the nature of the surface impacted. In the case of the steel plate, for both calibers, for angles of incidence of up to 30 degrees, the bullets tended to stay in one piece and retained approximately 75% of their impact energy. At angles greater than 30 degrees the retained energy declined in a linear relation with the angle of impact. Thus, at an impact angle of 50 degrees, the bullets retained only 20% of impact energy. In the case of the concrete surface, the retained energy of both calibers followed a linear relationship with the angle of impact. At an impact angle of 10 degrees, retained energy was approximately 75%; declining to approximately 20% at 50 degrees. Ricocheting bullets commonly tumble in their path through the air, having an unpredictable trajectory. Their entrance wounds tend to be larger and more irregular; the edges ragged, with the surrounding zone of abraded skin large and irregular. These wounds tend to be penetrating rather than perforating because when the ricocheting bullet impacts the skin it is deformed, unstable, and has lost a significant amount of its energy by ricocheting off a hard surface15 Almost immediately after penetration, the bullet begins to tumble in the body, losing its remaining velocity and kinetic energy in a short distance. 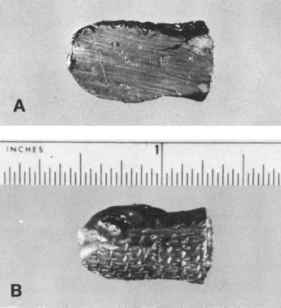 In the case of lead bullets, the ricochet bullet when recovered from the body typically has a flattened, mirror-like surface on one side (Figure 4.36). It is not uncommon to have the weave pattern of the clothing overlying the entrance imprinted on the side or base of the bullet, as the bullet may enter sideways or even backwards. In Figure 4.36 the bullet ricocheted off a steel rail, passed through a screen door, and then struck the deceased. The pattern of the screen is on one side of the bullet. Figure 4.36 (A) Ricochet lead bullet with mirror-like surface on one side and imprint of screen on other side (B). Full metal-jacketed bullets also ricochet. The bullet may flatten along one surface or even pancake with the core partly extruded from the base. Portions of the jacket may be avulsed off the bullet exposing the core. The weave imprint of cloth may be present on the lead base or exposed core of such bullets. Partial metal-jacketed bullets have a greater propensity to breakup on striking a hard object in comparison to lead and full metal jacketed bullets. They may pepper the body with fragments of jacket and lead core (Figure 4.37). Fragments are often found embedded in or just beneath the skin. Ricocheting shotgun pellets spread out in a fan-like pattern, parallel to the surface. Occasionally, a lead bullet recovered from a body is flattened on one surface like a ricocheted bullet, even though the bullet could not have ricocheted. This occurs when the bullet, on entering the body, strikes a heavy bone such as the femur, flattening on the bone. Such occurrences usually involves small-caliber low-velocity lead bullets, e.g., the .22 rimfire and a large, heavy bone such as the femur or humerus. 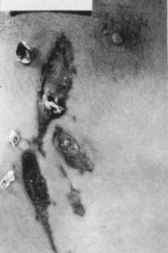 Figure 4.37 Fragment wounds of chest due to partial metal-jacketed bullet that disintegrated on striking ground. lead core will extrude out the base. The bone may or may not be fractured. The author has seen this phenomenon in calibers from .25 to .45. In the other circumstance, the full metal-jacketed bullet perforates two adjacent sheets of metal, e.g., a car door before penetrating a body. The first sheet of metal destabilizes the bullet such that it is traveling sideways when it impacts and perforates the second sheet. This second sheet of metal flattens the bullet along its long axis so that when the bullet is recovered from the body it has the appearance of a ricochet bullet. If an individual was close to the surface from which a bullet ricocheted, fragments of material from the surface as well as fragments of bullet torn off at the time of ricochet may impact around the wound of entrance, producing secondary missile wounds. These wounds are typically of minor significance in that the fragments are usually of insufficient mass and velocity to cause any serious harm. The marks produced may on occasion be confused with powder tattoo marks. The marks, however, are larger and more irregular in shape than powder tattoo marks. Occasionally a bullet that exits a body will strike a hard surface, flatten out, and rebound back into the clothing. The author has seen this in a number of instances. In two cases the individuals were leaning against concrete walls, and in a third the individual was lying on a concrete floor. The bullets were pancaked, having a thickness of less than a nickel.